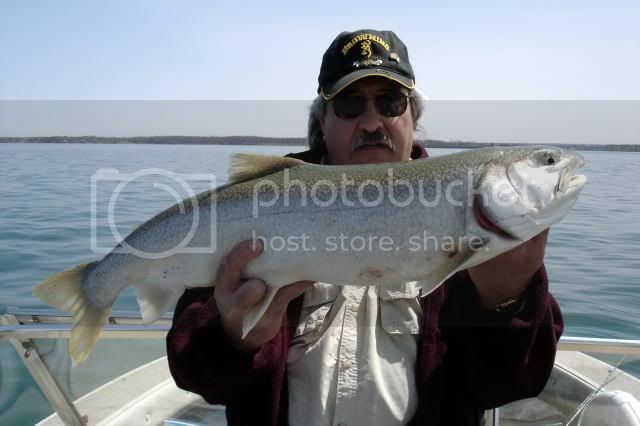 NY Outdoor news reports a fresh run of fish with many large ( >10 lbs) fish. It used to be that large was >20 lbs, but everyone is downsizing! 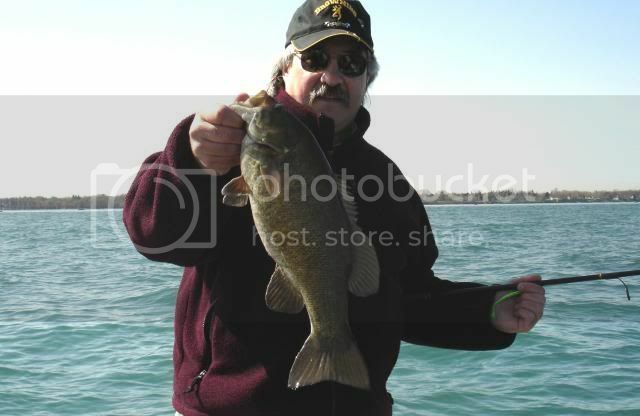 Lol...your right about that downsizing thing, seems to be the norm in Erie & Ontario fishing ! Niagara should have good numbers of Steel this time of year, now's when the hogs use to get caught. Line freeze and slush are your enemies now. I'd go every time it was possible to fish. "I feel sorry for the people who don't drink. When they wake up, that is the best they are going to feel all day"
You won't be wading the Niagara. Shore fishing requires a good pair of hunting boots. The rocks and shore are usually flat enough to move around but like any snow and ice covered area you need to be careful. The Niagara is very dangerous and drops off very quick. It has some crazy whirlpool boils as well as a strong flowing currents. Some actually flow or swirl upstream in certain areas. Don't take any risk if you fall in this time of year your in serious trouble. Just use common sense! The fish move all around the river so don't move too much sooner or later they will be in your area. Baits - Egg sacs , spoons , Vibrix Spinners, jigs , minnows (live or salted) and whatever else you catch Trout on. They will all work. Tips - if the river is pea green your in trouble low visibility, emerald green ,grab your gear! Line - I start with 8lb. and go from there up or down. Places to stay - Hope these numbers are still the same ............These are basic rooms mainly for fishermen close to the river. We stayed at the first two many a trip. There are other hotels near but are way more expensive. Dinning in Lewiston - Tin Pan Alley, or JJ's Cabin outside of Lewiston. There was a breakfast diner in town also. Grocery store in town also. Not sure about a license, no bait shops in Lewiston, try a Wal-Mart on your way. 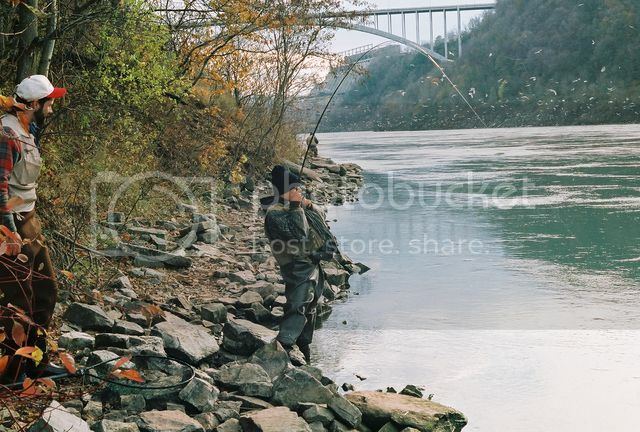 Fishing - Art Park area , Devils Hole area....ck out satellite maps. There are parking lots. Good luck, it's a challenge and it's an awesome place to fish, one good day and you'll be addicted ! 30 years later Niagara still rules ! 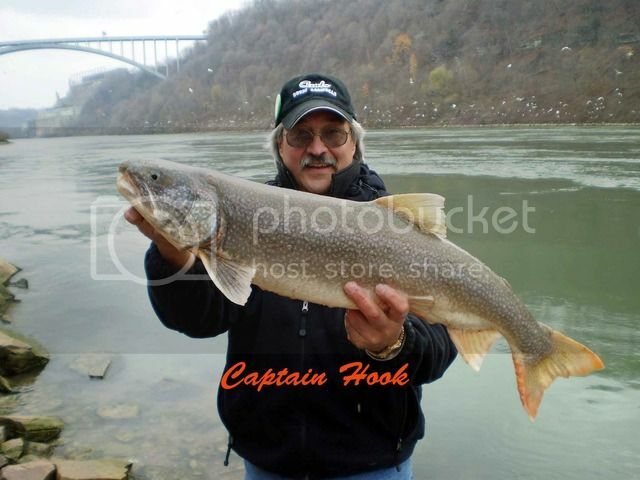 Put it on your bucket list if your a true Trout fisherman. Awesome river with an awesome view. Shore or boat it's a great fishery ! Your welcome .......don't mind helping others that enjoy the mighty Niagara! 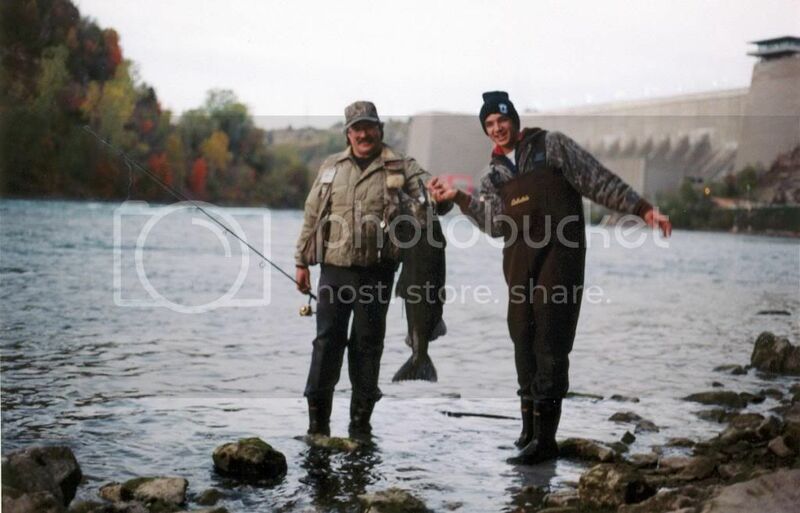 I along with family and friends spent many years traveling up there and we always enjoyed the fishing experience. 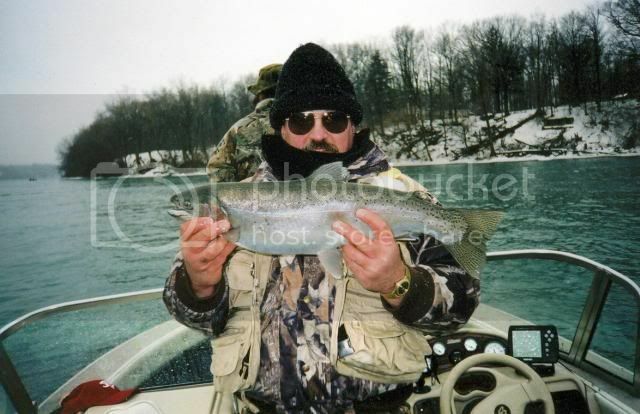 Just another tip for travelers heading to the Niagara to fish. Try and monitor the winds up on Lake Erie before locking in on your plans. High strong winds will make the Niagara murky usually a day or so later. If Erie is blowing strong for a few days the Niagara will most likely look pea green or worse. If Erie has been fairly calm a few days pack your gear and head up. My first step was to go down to the launch in Lewiston and look over the side walls , if you see the rocks under water fairly clear your in business ! Emerald green's your perfect color. NY power plant as seen from Canada. Notice fishermen on metal pier platform on right side. I fished that area before and after the platform was built. No parking there employees only ,you must walk the Power Plant entry road down hill. Very long walk, especially back up hill . 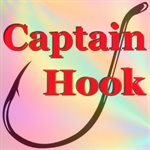 Captain Hook, I want to thank you also for all the heads up. I am going up this spring for the first tine Going to shore fish but an going to bring my 19' Larson just in case. I am a lone fisherman. 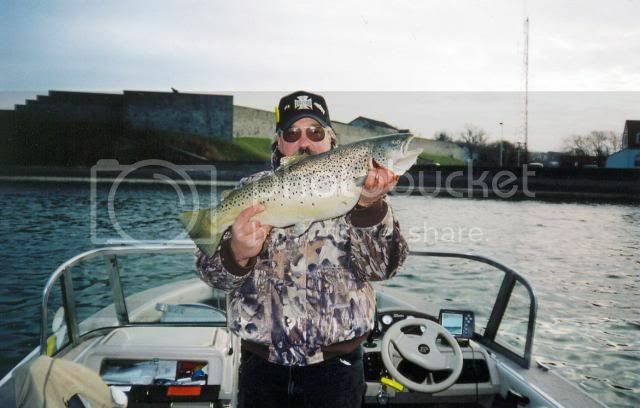 Good luck , Spring time fishing is very good especially out near the mouth (Bar) or Fort Niagara area. There is not much shore fishing open at the mouth. Coast Guard and Fort Niagara own all that , and it has no access for shore fishing that I know of (too bad)at least on the river side. Boats do well just fishing around the buoy out in the lake. Drifting bait , jigs , lures will do best. Check your regulations also, some limits are different from Fall to Spring some are out of season also. 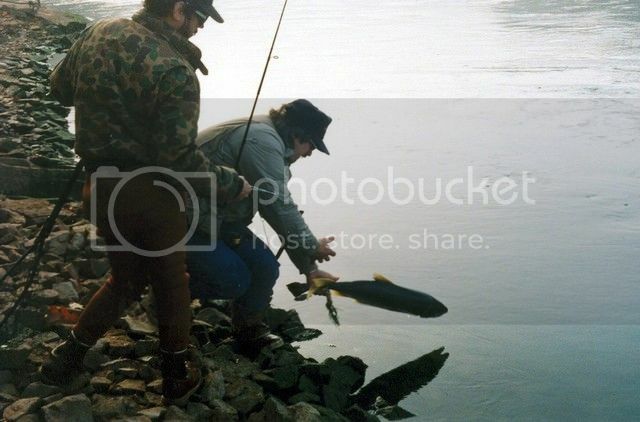 We never kept any Lakers ever , only a few Steelhead , Salmon , and Browns. Most of our fish were returned after photos. 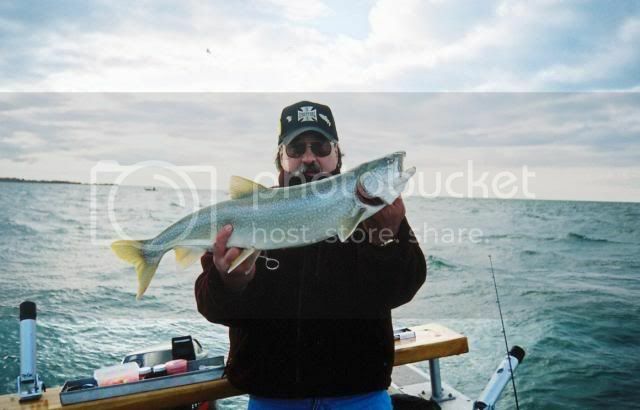 There are also Musky , Pike , Smallmouth , and Walleye in Niagara as well. We have caught all along with the Trout and Salmon. CAPT. one last question, is this a realativly good time to go to the NIAGARA or wait till spring, it is a long Drive! 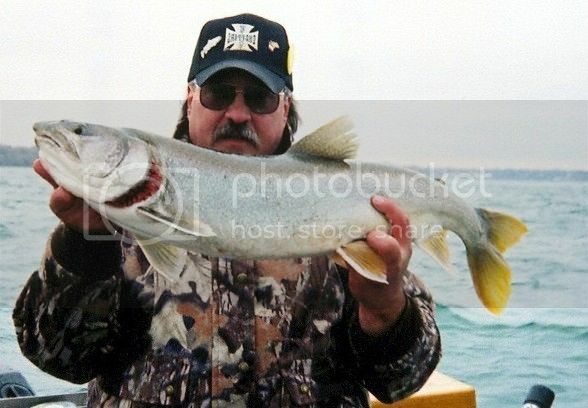 Manistee is prime March thru April. 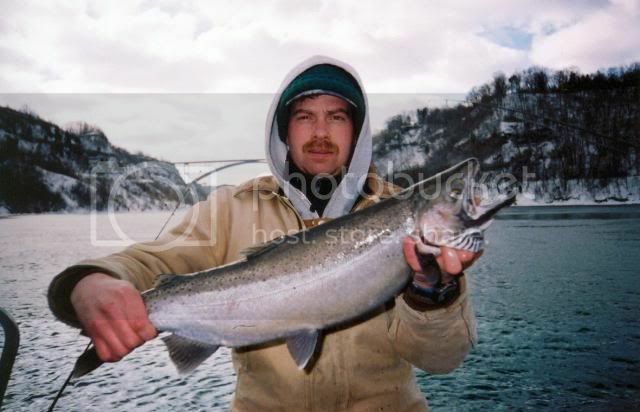 I'd say now Steelhead would be more dominate in the Art Park, Devil's Hole area. Salmon will mostly be gone or done. Lakers will be around, but not in big numbers as late Fall. 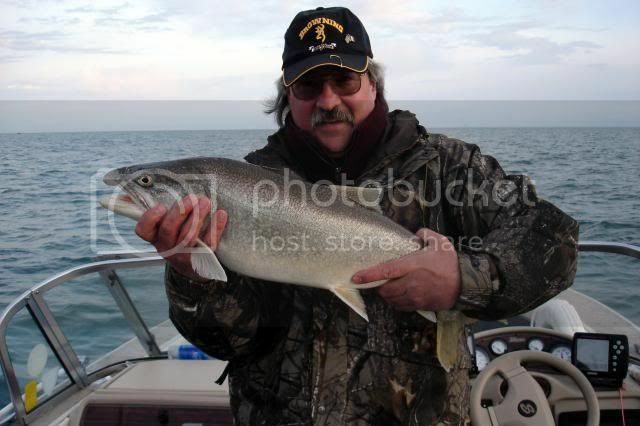 I was told by locals a lot of the Lakers winter in the Whirlpool area of the river mainly on the Canadian side. Once again it's what your targeting. Spring time we boat fished the lower river and mouth mostly getting Lakers and Small Coho's and a few Chinook hardly any Steel or Browns. Fall we caught all varieties from boats and shore. 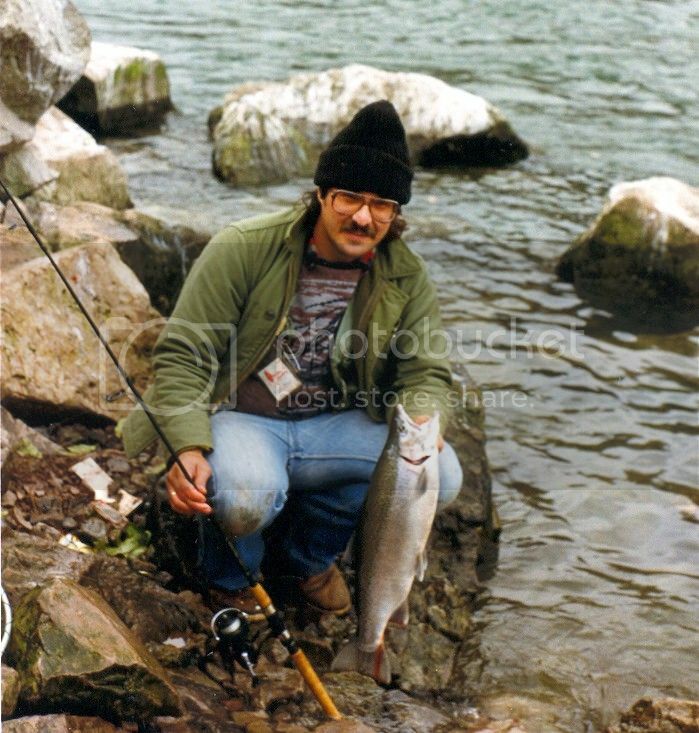 If your targeting a trophy Steelhead now till March would be my choice. There are some good river boat guides also if you have the cash. They might give you a few tips as far as fishing and conditions also even if your just interested. A long travel makes it tough to zero in on good fishing. We traveled about 4 -5 hours, but we always stayed at least 3 days or more to allow for weather and water changes. Sometimes we hit it right and other times it was a bust ! We would go both Spring and Fall many years. Spring wait till ice in river is gone maybe mid - late April or later. Fall we liked anywhere around Thanksgiving give or take a week. Mother Nature controls the game . What happened to the short post about the charter and sport store at the landing? If you were inquiring about the bait shop (A-1) that use to be in the round building near the launch it had closed up years ago. It was nice and convenient while there. I don't know if it has ever reopened again. 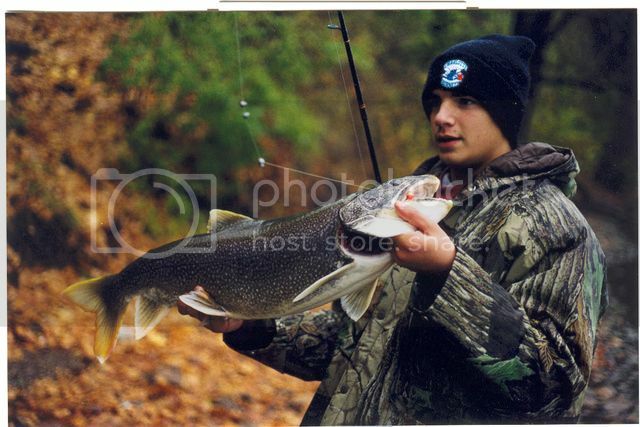 As far as I know there aren't any bait shops in the Lewiston area anymore. Use to be Kim's bait in Lewiston, and Devil's Hole bait shop up by the power plants, but they also closed years ago. The parking is on top the hill. Not a lot of spots but it works on most days. 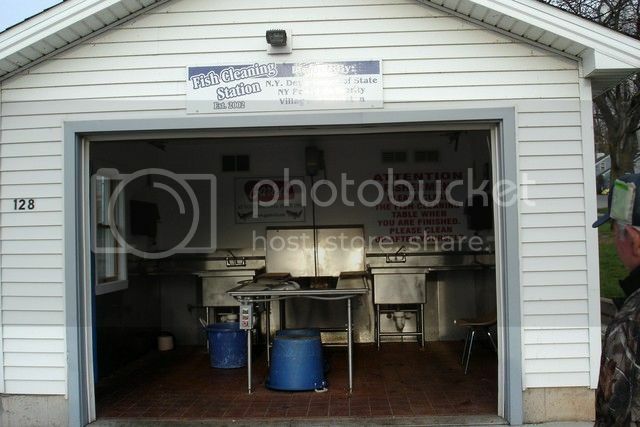 The fish cleaning station is up there too. All are free to use. 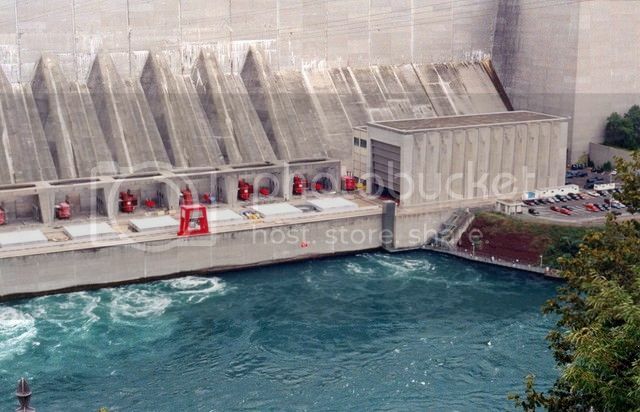 The flow at the power plants is very fast and can be treacherous to both novice and seasoned boat anglers. I would not attempt it especially alone ! You must leave your motor running at all times up there just so you have emergency motor power if needed! The drift is very fast with boils of currents all thru. As a beginner on the Niagara I would stay away from there. 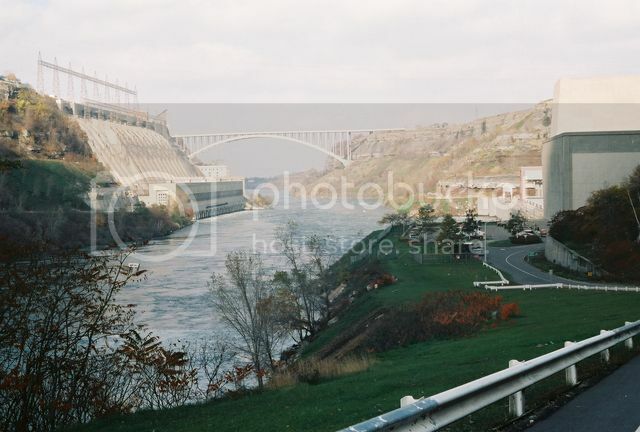 If you want to witness the Devil's Hole area drive up to the NY power plant. They have a lookout area in the visitor center there, or drive past the center and park at the road entrance and walk down to the power plant on the road. See pic # 3 that's it. (Devil's Hole), it cost him and one female passenger their lives! One passenger was luckily saved by another boat in the drift. Even with life jackets on I'm not sure one will survive those currents and whirlpools if you fell in that area! That boat got sucked in the current at the transom and rolled completely over. The boat was recovered miles down river. I would recommend staying in the Lewiston drift on down river. I would also keep a life jacket on or very close by just for safety. Fishing can be awesome at times, but use common sense this river can be dangerous to all fishermen. 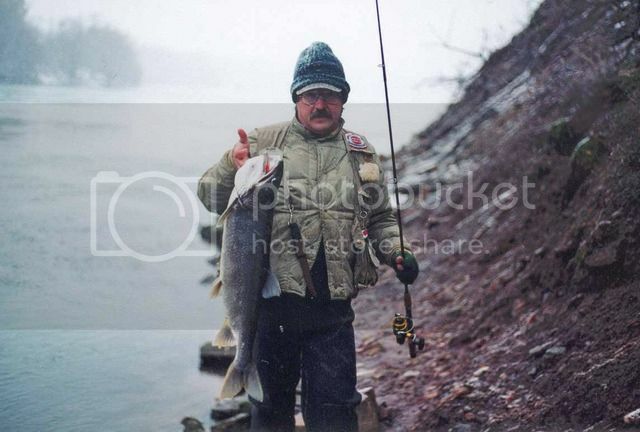 I've fished the Maumee river too ! In NYS, life jackets are required to be worn by everyone on any boat, powered or not, less than 21 feet, from November 1 to May 1. Hello one and all I just discovered fishing in the devil's hole/whirlpool area and I'm having the hardest time, I started with vibrax spinners (chrome and gold ) lost every single one of them I'm now experimenting with beads so far I've ran yellow clear red and pinkish ones (10mm and 8mm) I'm 90% sure I got at least 1 nibble. Have you thought about using just egg sacs for starters ( dime size ). Now is a tough time, a lot of fish are lake bound or have dropped back by now. Are others catching fish there ? Better on the lower river end I would say now. It's been a few years since I've been up but I'm old school on the Niagara .... you better be clicking or bouncing on the bottom if you want to catch more fish ! Snags are ruthless some days. I don't think bead size matters , maybe color mix helps. I like Nov/ Dec. on the Niagara best from shore. 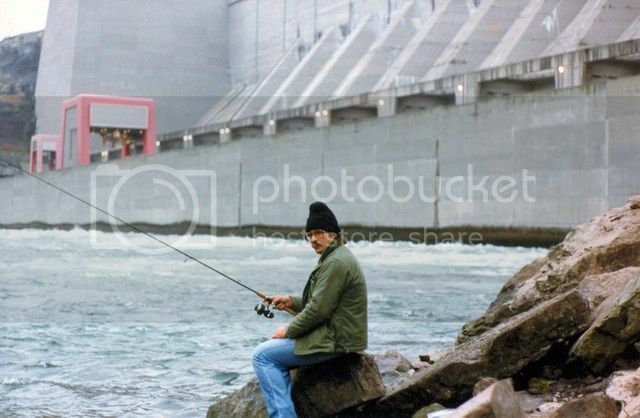 Probably better to fish some what close, according to channel maps water drops off to around 100 feet deep not far from shore, you will get snagged on the ledge if you are fishing too far out. I found it the hard way, I was up too late in the year and water was off color and air was cold 14 degrees.